Although a coordinated national policy on climate change should be developed, initiatives at the local government level through the land use planning and regulatory control processes have tremendous potential to dramatically contribute to the reduction of green house gas emissions, leading to a reduction in the carbon footprint and ultimately to a more sustainable environment. Part I of this article discusses opportunities for using the comprehensive land use planning process to address sustainability and provides examples of how this is being accomplished across the country. Part II mentions the growing number of state and local climate action plans (and cross-references a forthcoming article from the Houston Environmental & Energy Law and Policy Journal that details current developments in this area). Part III focuses on addressing emissions through the use of environmental impact reviews, and Part IV highlights how sustainability is being addressed through zoning and other land use regulations. Part V examines how green building standards are addressing sustainability, and Part IV illustrates how stormwater and landscaping initiatives are also being employed to accomplish these goals. What do environmental lawyers consider the most significant environmental cases? In 2001, Jim Salzman conducted a survey of the envlawprofs listserv for the "Most Excellent" environmental law cases in the field, tabulating the top cases for law profs and for practicing attorneys. Given the significant decisions over the eight years, we thought it would be useful to conduct the survey again, this time using a dedicated website and surveying both the envlawprofs listserv and members of the ABA's Section on Environment, Energy and Resources. We enjoyed a high level of participation, with over 440 responses from across the nation, from academics and practitioners alike. Among the most interesting findings are: (1) not surprisingly, Chevron remains firmly in the Top Three cases; (2) more surprisingly, the relatively young Massachusetts v. EPA has vaulted to the top as the most significant case in the field; (3) most surprisingly, Rapanos scored in the Top Three in most categories of respondents and in the top four for almost all the categories; (4) TVA v. Hill , while still a favorite among academics, has faded from prominence among practitioners; and (5) some of the classic environmental law cases that scored high on the 2001 survey, such as Overton Park and Ethyl Corp., have fallen off the cliff. Our article discusses the findings in more detail and our musing explanations for the surprise results. The Telegraph: If Countries like Dubai begin to fail, who will save them? I'm sure we'll be hearing a lot more about Dubai and its financial and land development problems in the coming weeks. This is a critical reading of the current literature on law and geography. The article argues that the literature is characterized by an undertheorization of the concept of space. Instead, the focus is either on the specific geography of law in the form of jurisdiction, or as a simple terminological innovation. Instead, the article suggests that law's spatial turn ought to consider space as a singular parameter to the hitherto legal preoccupation with time, history and waiting. This forces law into dealing with a new, peculiarly spatial kind of uncertainty in terms of simultaneity, disorientation, materiality and exclusionary corporeal emplacement. The main area in which this undertheorization forcefully manifests itself is that of spatial justice. Despite its critical potential, the concept has been reduced by the majority of the relevant literature into another version of social, distributive or regional justice. On the contrary, if the peculiar characteristics of space are to be taken into account, a concept of justice will have to be rethought on a much more fundamental level than that. This essay examines the complexity of the social and cultural forces in antebellum Boston that led to the framing and resolution of the legal and constitutional issues in the Charles River Bridge Case. Though often viewed as a clash between models of economic development, the lines of conflict in the case in reality were first honed in pamphlet wars in the early Jacksonian turmoil of the 1820s focusing on other often overlooked contemporaneous Boston free bridge disputes and the birth of a free bridge political party. Boston elites were pejoratively termed “aristocrats” for their support of the Charles River Bridge franchise and accused of defending the creation of exclusive and monopolistic privilege and property through government grant, while proponents of a new competing - and ultimately free - bridge were castigated as “agrarians” and accused of forcibly taking property in order to equalize its distribution in the face of a state-sanctioned privilege. The driving force of the dispute, therefore, turned out to be the acute social anxiety and stress of Boston’s investors and commercial elites. No one better signifies the contours of the struggle than Simon Greenleaf, recently arrived in Cambridge as a law professor at Harvard. Greenleaf, as one of the lawyers for the competing Warren Bridge, stood in opposition to the established Charles River Bridge interests and was responsible for shaping the legal arguments that ultimately prevailed. For that sin, he was pilloried in the public press and ostracized in the community. Greenleaf’s unhappy experience then becomes a metaphor of sorts, allowing us to appreciate how understanding a social environment can assist us in cracking the code of legal arguments, particularly in this instance early Contract Clause and Takings jurisprudence. In the process of examining this historical episode, we might wish to consider under what conditions legal history might be entitled to call itself a form of social history and to speculate whether the critical question for legal historians interrogating these events is not whether law matters, but rather of what matter law is made. Our intrepid co-editor Matt Festa posted a great summary on November 24, 2009, about the recent win for builders in the New York City takings controversy over the Atlantic Yards project in Brooklyn. Atlantic Yards, as envisioned, will comprise twenty-two acres, including eight acres of public open space, an 18,000-seat arena, residential buildings, office towers, retail, and a signature tower--"Miss Brooklyn"--by architect Frank Gehry. Click here to read the Wall Street Journal's take: Suzanne Sataline, Matthew Futterman, & Chistina S.N. Lewis, "Builders Net Win in N.Y. Case: Court Says State Can Claim Land for Brooklyn Project; Game is Back On for NBA Arena" (Nov. 25, 2009). One line in the article was striking to me: "The decision is a blow to private-property owners who have argued that they are defenseless in protecting their ownership rights once a government deems their land necessary for eminent domain, or the 'public good.'" Holding aside the merits of the Atlantic Yards project and Kelo, the decision is not so much a blow to private-property rights, but a harsh reminder that property is a system of rights, duties, and relationships amongst people with respect to things, tangible or intangible, as endorsed by the state. In other words, our property rights exist only to the extent the government will guarantee them. "Being now passed the vast ocean, and a sea of troubles before them in expectations, they had no friends to welcome them, no inns to entertain or refresh them, no houses, or much less towns, to repair unto to seek for succour; and for the season it was winter, and they that know the winters of the country know them to be sharp and violent, subject to cruel and fierce storms, dangerous to travel to known places, much more to search unknown coasts. Besides, what could they see but a hideous and desolate wilderness, full of wilde beasts and wilde men? . . ."
Immediately after oral argument in the Supreme Court, hear advocates discuss Stop the Beach Renourishment, Inc. v. Florida Department of Environmental Protection, which presents the question whether a judicial change in the common law can “take” property from landowners in violation of the federal Takings Clause. The case also raises questions about how a state can legislatively address beach erosion and modify the boundaries between public tidelands and private uplands, issues that will grow in significance as sea levels rise due to global warming. Briefs in the case can be found at http://www.abanet.org/publiced/preview/briefs/dec09.shtml. Ilya Shapiro, Cato Institute, Counsel for Amici, Cato Institute, et al. Thanksgiving is a land use holiday. Good and bad, it touches on the many facets of Native American ownership, European colonization, and the spread of English property law. Groups that observed thanksgiving holidays tended to do so with respect for the circumstances that made life a challenge beyond anything most of us will ever encounter. It is an easy land use decision to acknowledge prior thanksgivings. Thanksgiving--from the Pilgrims to Lincoln--also touches upon the meanings of citizenship with respect to the land. Please check out Will Cook's post on the Pilgrims and land use, and have a most happy holiday. A happy Thanksgiving to all land use lawyers and practitioners. This is a couple years old now, but every fall when I teach eminent domain at the end of Property II, I am reminded of this excellent example of hard-hitting investigative journalism. Jon Stewart and Nate Corddry try to get to the bottom of a potential eminent domain scandal involving Deepdale golf course on Long Island. Apparently the town proposed taking the country club golf course through eminent domain under the rationale that the public would benefit from access to the private course. This story came out the year after Kelo. So, for a holiday procrastination or study break (and featuring an appearance by Rodney Dangerfield) watch the clip here: The Daily Show, "Course Correction." In 1949, President Harry Truman convinced Congress to break with the past and inject the federal government into process of developing cities and financing housing. The 1949 Housing Act expanded the availability of federal insurance for home mortgages, igniting the growth of new suburbs farther and farther from the centers of our cities. Together with federal highway funds that came a few years later, the 1949 law started what we now describe as “suburban sprawl.” The two initiatives put Americans on the path of long commutes, heavy traffic, air pollution, water shortages, and a long-term increase in carbon dioxide emissions, which fuel global warming. Federal money and policy leadership help a lot. But the federal government has limited power to change local decisions governing land use and real estate development. A reversal of the ill effects of sprawl will take committed local officials who are willing to change land use policy and zoning even in the face of resistance. Architects, real estate developers, bankers, and city planners must collaborate to create vibrant urban spaces that meet consumers’ needs. If this topic interests you and you'd like to know more about it, I recently published an article related to it with the Tennessee Law Review called "All Sprawled Out"--you can read it here. The last major obstacle to a groundbreaking for the $4.9 billion Atlantic Yards development in Brooklyn fell Tuesday when New York’s highest court, the Court of Appeals, dismissed a challenge to the state’s use of eminent domain on behalf of the developer, Bruce C. Ratner. . . . The Court of Appeals ruled that the state could exercise eminent domain in seizing the 22 acres, much of which sits within an urban redevelopment area, for Atlantic Yards. Critics of the project had argued that eminent domain on behalf of a private developer was improper and a violation of the state’s Constitution. Here is a link to the Court's opinion in Goldstein v. New York State Urban Development Corp., just released today. Commentary from the opposition at Develop Don't Destroy Brooklyn, and a great roundup of stories and links at No Land Grab. Not a great shocker in the result, considering NY's state court precedent on eminent domain, and the fact that New York is one of the only states without any sort of post-Kelo law (purporting) to restrict economic development takings (again, see Ilya Somin's critique of post-Kelo reform attempts). However, this is another high-profile eminent domain case in the books to annoy takings opponents. It may have an effect on public opinion and the feasibility of future large-scale redevelopment projects that require delegation of the government's eminent domain power for private land assembly. Will it add to the impact of the Pfizer pullout in establishing, as the NY Times suggested, a turning point for eminent domain? New London, like Poletown, was a project that may have been doomed from the start. Atlantic Yards is a similar pie-in-the-sky comprehensive redevelopment project, but perhaps it has a better economic foundation, with participation of a major-league sports franchise and its location in the hip borough of Brooklyn. If it fails, it will surely add to the arguments against economic development takings. If it succeeds, it will probably just egg developers on. If it does proceed, for the sake of Brooklyn I hope that Atlantic Yards will turn out better than New London. UPDATE: Ilya Somin has a thorough analysis at the Volokh Conspiracy. The Law and Society Association will have its annual meeting in Chicago from May 27-30, 2010. The LSA is a big national conference but in my experience it is much more open to wide participation than most other conferences--particularly for junior scholars, graduate students, and aspiring academics. It's also one of the more interdisciplinary conferences out there (relevant to the interdisciplinary nature of land use), with lots of participation from the social sciences and the humanities as well as the legal profession. Plus, Chicago is an interesing land use city in its own right. The deadline for panel and paper proposals is December 8. Check out the Call for Participation. I'd like to see more land use, local government, and property law panels at LSA. Feel free to leave a comment or email me if you are interested in proposing a land use panel. Forbes.com has an article about the areas that are doing the best at weathering or recovering from the recession. Omaha comes out on top, and Texas cities do quite well too. Though Omaha, Neb., seems second-rate to some, Warren Buffett may have been on to something when he chose it for the headquarters of his massive holding company, Berkshire Hathaway. According to our research, the city has hit upon a formula to weather the economic downturn better than any other in the country. While no region has escaped the recession, in Omaha, three Texas metros, a handful of Northeastern manufacturing bases and select southern cities, diversified industry and relatively stable housing fundamentals have provided local residents with comparatively secure standards of living. View the complete list here. Top 10: (1) Omaha; (2) San Antonio; (3) Austin; (4) Pittsburgh; (5) Harrisburg; (6) Dallas; (7) Rochester; (8) Houston; (9) Raleigh; and (10) Baton Rouge. I'm not surprised to see Omaha and the Texas cities on the list. Two things are worth noting, though. First, the presence of a number of northeastern cities on both the top 10 and the full list: Pittsburgh, Harrisburg, Rochester, etc. These older northern industrial cities have been considered to be in decline for a while. Could it be that they are doing relatively OK because they may have already hit their low points--having been left behind during the last two bubbles, they might be stable? Secondly, you don't see many "sun belt" cities--which have dominated the growth charts in the last two decades--near the top, outside the Texas triangle (and Raleigh in the Research Triangle). We all know that Arizona, Nevada, and Florida are among the places hardest hit by the mortgage crisis. Does this support the nascent idea that the sun belt is giving way as a geographic identifier to the Zone of Sanity? According to Joel Kotkin, the Zone of Sanity encompasses the vast middle of the country, from Minnesota to Texas, that was largely ignored by the bubble and is doing relatively well in the aftermath. A new ordinance requiring new housing starts to undergo energy inspections cleared its last hurdle Nov. 17 and will be sent to the City Council amid ardent opposition from the local home builders association. The proposed law, which adopts the 2009 International Energy Conservation Code, will supplant an old rule that only required a sampling of similar new housing by the same builder to be tested. The new rule will instead mandate testing for every single- or two-family unit by outside contractors. At the Nov. 17 hearing, Home Builders Association of Greater Austin Executive Vice President Harry Savio said the new codes will add 88 cents per square foot to the cost of new houses in Austin and further slow sluggish permitting offices that are understaffed. The inspections would be for heating, ventilation, and cooling of all new residential units. Austin has contemplated a policy goal to have all new homes be zero-energy by 2015. Whether adding new requirements during a recession is a wise move remains to be seen. I just had a very interesting conversation with James van Hemert, director of University of Denver's Rocky Mountain Land Use Institute. Some of you may attend their annual conference in Denver. The theme next year is "The New American Landscape" and the conference will be held March 4 & 5th. The Institute also has some fascinating long term projects highlighted on their website. The one that particularly intrigues me is the Sustainable Communities Development Code. This is a very comprehensive set of incentives and model code that addresses many aspects of sustainable land use, include climate change, transit-oriented development, water conservation, and food production and security. It's an extremely ambitious project and James and Institute co-founder Christopher Duerksen have pulled it off using mostly pro bono and student assistance. Another Institute project that has an interdisciplinary public health component is Planning for Active Community Environments. This is a series of community trainings on collaboration between public health and land use advocates. We've all read about the connection between sprawl and obesity - this is an effort by the Institute to address this issue in a very practical way. In October the FDIC held a large auction of properties it had acquired as a result of failed banks in Georgia. I thought this was an interesting story and wrote about it before the auction took place. It was my intention to write about it again after the results of the auction were released. No such luck. The FDIC has decided to keep us in the dark on this one. The following is an email I got from JP King, the auction house who ran the Georgia auction: “Unfortunately, FDIC has prohibited us from releasing any information regarding the auction. We've been trying to get them to let us release the results, but they have denied our requests. We aren't allowed to release any details.” I would have thought that the results of a pubic auction of properties owned by FDIC would have to be publicly disclosed. So why is the FDIC trying to cover this up? The answer is that the REO problem for the D.C. lenders and the FDIC is reaching a crisis level. In spite of every effort to avoid foreclosures the fact is that the number of properties owned by the Feds is rising on a daily basis. Simply put, this is outrageous and runs completely counter to any credible claim about the federal government embracing a policy of transparency. I don't want to turn this into a political issue because it's much more than that. It is now a systemic problem, if not fraud. Indeed, both parties are complicit in this situation. Which, in some ways, makes it even more disturbing. Here you have the federal government (in this case the FDIC) owning real estate, placing that up for auction, and then refusing to disclose the results. I've reviewed the relevant statutes and cannot find any legal authority allowing the FDIC to prevent the disclosure of this information. There is simply no way for local governments to reliably assess the value of property for taxing purposes if this type of obfuscation continues, much less permit the private market to accurately value real property for sales and development purposes. Well, I'm back from one of the most, er, unique places in the country--Las Vegas, Nevada. Now, I've been there several times before but this is the first time that I very intentionally wandered up and down the Strip considering land use issues. I looked at setbacks, building heights, signage and listened to the sounds and noise emanating from nearly every angle. Needless to say, it was a bit overwhelming in its uniqueness. While I haven't spent much time looking at the relevant land use codes (I do know that most of the area known as the Strip is actually regulated in the county rather than the city of Las Vegas), I suspect that it is the most diverse land use codes in the country (and quite possibly in the history of mankind). After all, some buildings have zero setbacks while others have ones in excess of a hundred feet--in several instances, nearly adjacent to each other. You have buildings from over 30 stories to less than 3 on the same block. Talk about form-based coding diversity! 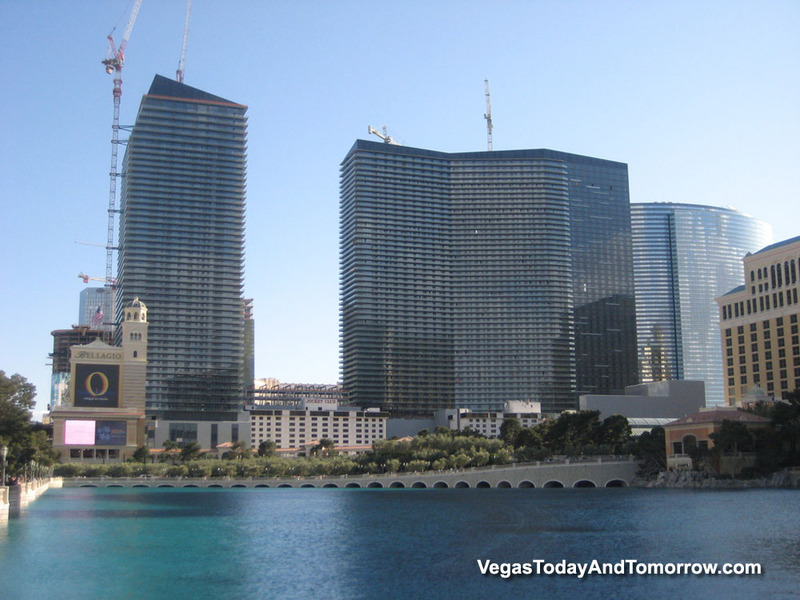 Then, you have some very curious situations such as the juxtaposition of MGM Mirage's City Center, the under development Cosmopolitan resort and this little place called the Jockey Club. 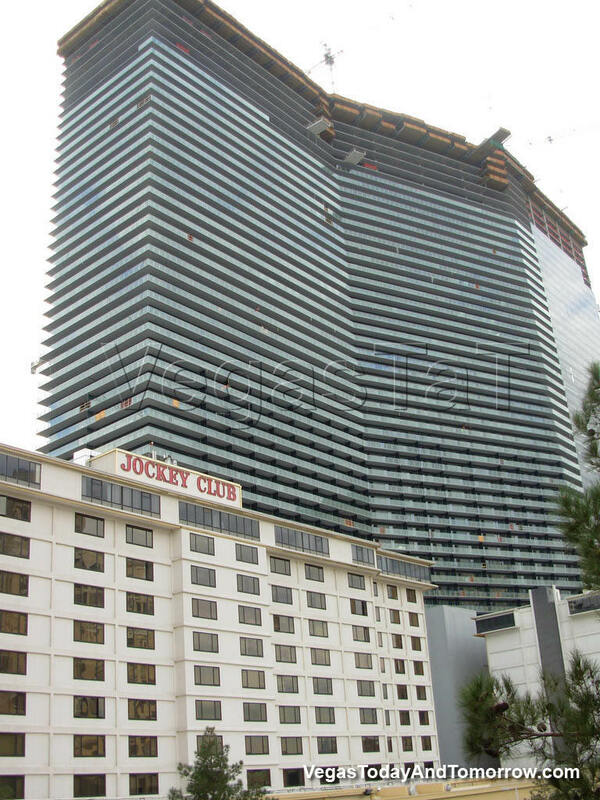 The Jockey Club appears to be some type of circa 1980s apartment/time share structure. 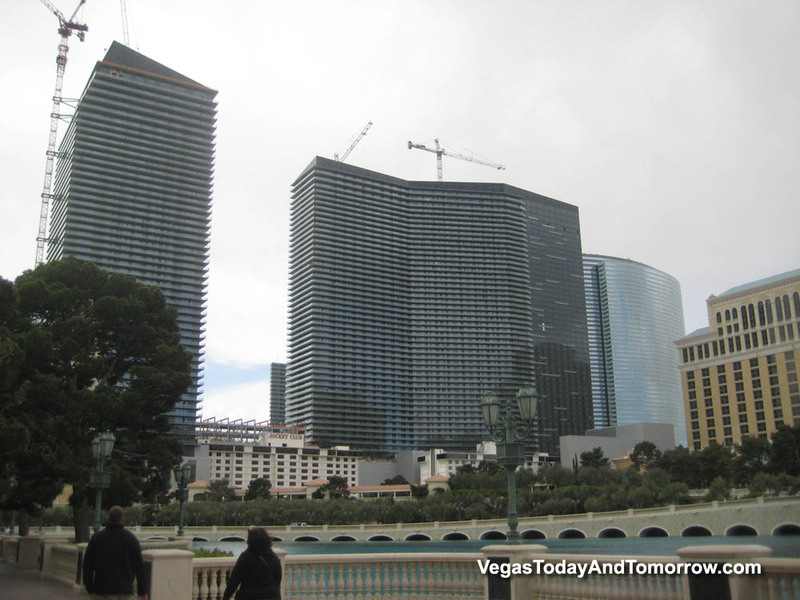 What makes it curious is that it is nearly completely surrounded and towered over by City Center and the Cosmopolitan. This whole set-up probably made several attorneys and surveyors rich drafting the easements as the ingress and egress and overhangs and setbacks seem to turn on a matter of feet, if not inches. For some images of the set-up, click here, here, here, and here. 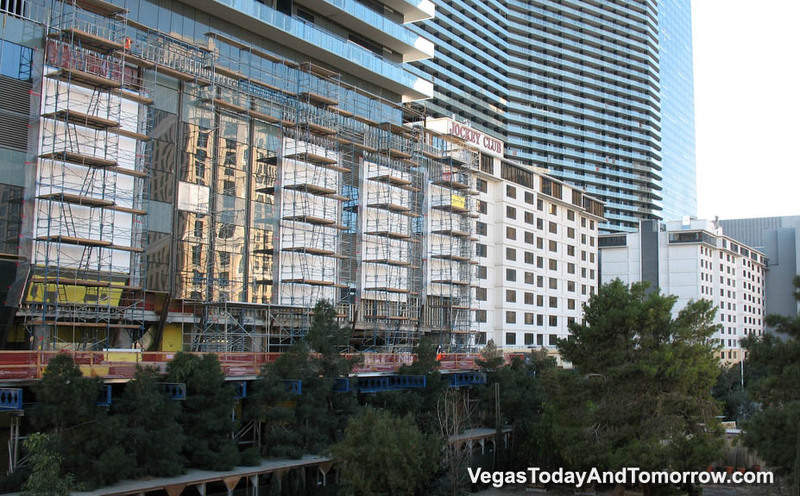 And, if the physical site was not complex enough, the business issues facing the Cosmopolitan add into the drama. Anyhow, hopefully Ngai Pindell will have some time to expand on this situation located roughly 4 miles from where I suspect his land use and property classes meet. As someone who frequently takes my land use class on "site visits", after touring the Las Vegas Strip with an eye toward land planning and regulation, I quickly became quite envious of the many options that Prof. Pindell has nearby. The purpose of this Article is to bring to the forefront of discussion bedrock principles of land use law, which have been ignored to date, and to place RLUIPA analysis on a more constitutionally sound base. The Article is divided into three main sections. Section I recounts the history of land use principles from the drive to ordering urban centers in the seventeenth and eighteenth centuries to the development of the rich amalgam of modern practices that now constitute local land development and planning. Section II examines the Supreme Court’s constitutional doctrine of land use law and describes the federal laws that directly or incidentally affect local land uses and shows that these few are cabined within narrowly circumscribed arenas or in fields in which federal coordination of the states is necessary. These laws are readily distinguishable from the sweeping effect of RLUIPA on local land use determinations. Section III then looks closely at Section 2(a), to show how it impacts local decision-making, and operates as a radical and careless interference with settled constitutional principles. In addition, it points out that state courts have a history of rooting out invidious discrimination against religious landowners and invalidating discriminatory or arbitrary zoning and permitting decisions. I really look forward to reading this.